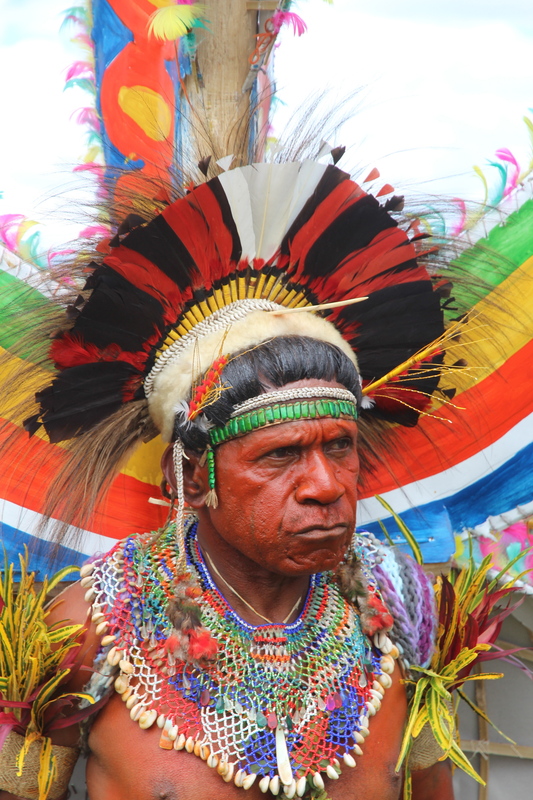 Fabulous faces of the Goroka Show—and some sky-high headdresses | Where to next? 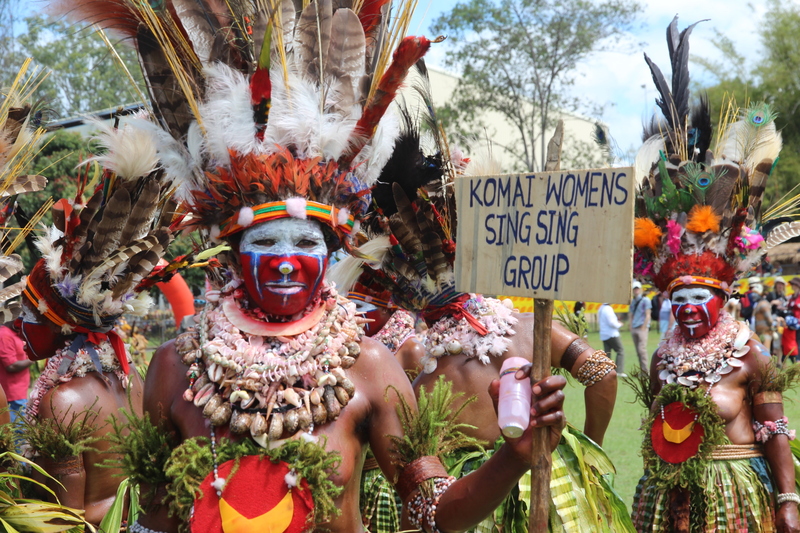 With more than 130 tribes prancing, dancing, singing, whooping, drumming and jumping around the Goroka Show, I hardly knew where to look next. Most performers make their own costumes, and some spend years embellishing and enhancing them. I was told that many performers carry their costumes to and from the show wrapped in newspaper. Can you imagine storing one of these from year to year? It’s amazing how nature provides almost all the materials used in costume construction. There are shells, ferns, leaves, bark, beads, nuts, skins, flowers, rope, twine, wood, and feathers, feathers and more feathers. Indeed, I cringed to think how many birds gave their lives to provide the tens of thousands of feathers used in so many of the headdresses. I know that most of the orangey-goldy feathers are from the national bird, the Bird of Paradise. The very long black feathers are from drongos. the large crescent shaped shells—usually worn on the chest—are kina shells. The local currency is called the kina. The range of colours is overwhelming. And the photos are the best evidence of that. Sorry but I don’t know the names of most of the groups. But the pic directly below makes the identity of this tribe clear. Stay tuned tomorrow for a look at the kids participating in the Goroka Show. So great to see the young ones being involved. Love the pictures. And the colours. And the faces. Beautiful. You can see why I’d like to return next year! Wow! Love them all, Peggy! Thank you! Your photography skills treat your audience to so many marvelous spots in our wonderful world and you’ve really told us all an incredible story. I thought I’d be able to pick out my favorite however you’ve made that just too hard so I’m defaulting to your main/lead photo due to it’s prominence along with the oh-to-unhappy expression on his mug! My favorite is the fellow with mostly yellow upper face with a red stripe going down the center vertically and an explosion of orangish/peachy plumage out the top of his head. It really is an amazing get-up. But I love them all. Fabulous photos – what a feast of colour and pattern! Oh cripes, Rhonda, you’re probably right. Nothing worse that turning up to a special event in the same outfit! WOW! Very expressive faces and great pics! Who said you can’t act with kids—more stars from the Goroka Show | Where to next? Asaro mudmen do their best to scare the begeezus out of us | Where to next?